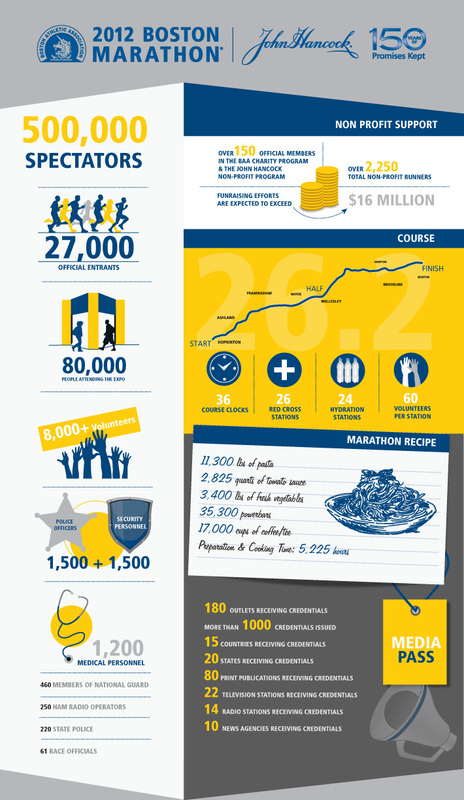 Boston Marathon Infographic | Fit Girl. Happy Girl. I am so sorry for neglecting my blog the past week, school has been crazy busy but don’t fret, I will be back in full force tomorrow with some new blog posts. In the meantime here’s a cool infographic from yesterday’s Boston Marathon. As a Massachusetts native, and the daughter of a former marathoner, Marathon Monday has always held a special place in my heart. My dad ran the Boston Marathon a total of eight times during his running days and I can only hope to run it some day.